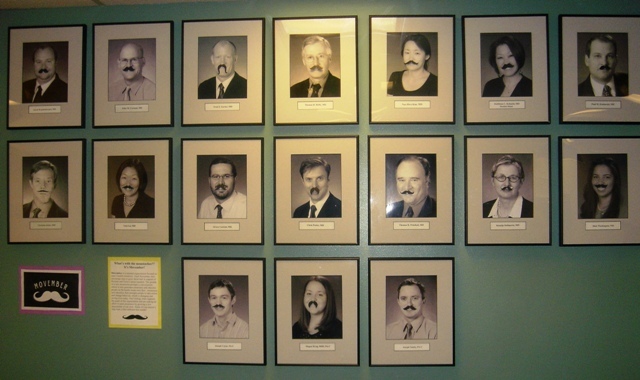 If you’ve been by the Urology Department this month, you may have wondered why so many of the doctors are looking a little scruffy. Perhaps, a little too close to looking like Tom Selleck for comfort? Do not worry. While the much maligned moustache is indeed making a comeback, this favorite facial feature of the 70s is only being sported because it’s Movember. Movember is a global initiative encouraging men (Mo Bros) to grow the Mo (moustache) for the 30 days of November. And Virginia Mason’s Urology Department is in full support of the initiative: John Corman, MD; Paul Kozlowski, MD; Jared Brandenberger, MD; Christopher Porter, MD; and Alvaro Lucioni, MD, are among the many who have embraced growing a Mo. “As one of the region’s most prominent health care organizations, our support of men’s health initiatives is an obvious match. By growing facial hair we demonstrate solidarity with our prostate and testicular cancer patients and reaffirm our support for men’s health care research and innovation,” says John Corman, MD, medical director for the Virginia Mason Cancer Institute and Mo Bro. It’s obvious the Mo has special powers to raise awareness and funds for men’s health. Movember’s main goals are to combat prostate cancer, testicular cancer and mental health challenges. Because many men find it difficult to discuss personal health topics with their loved ones, or even their doctors, Movember helps open the door to discussion in a fun and engaging way. Movember’s official website notes the growth of a new moustache prompts a conversation, which in turn generates awareness and educates people on the health issues men face. This can prompt men to take action. The Urology Team looks great with ‘Mos. And why is taking action so important? Compared to women, men die five years younger on average, the suicide rate is four times higher, and men are 24 percent less likely to go to the doctor. “The most important message from Movember is to know the facts about men’s health and to get screened,” says Mo Bro and surgeon Paul Kozlowski, MD. Urologist and Mo Bro Christopher Porter, MD, medical director, Clinical Research, is participating because it “represents an opportunity to reinforce the importance of the impact of testis cancer in young men.” He adds the Movember Foundation also offers grants that support research in both prostate and testis cancer. Virginia Mason is working on a collaborative research effort with Movember and Fred Hutchinson Cancer Research Center to evaluate the genomic sequencing of metastatic prostate cancer. Movember started in Melbourne, Australia in 2003 with two men who wanted to bring back a past fashion trend – the moustache. Movember came to the U.S. in 2007 and this year, there will be official Movember campaigns in 21 countries. Globally, 3 million participants have raised more than $446 million to date. More information about Movember and men’s health can be found at http://us.movember.com/mens-health. A goog laugh and interesting article about Urologists! Love the Tom Selleck reference.